Delhi Daredevils, the most unsuccessful team of IPL, thought of forget everything about that previous decade seasons and start fresh. They retained only Rishab Panth, Shreyal Iyer and Chris Morris for this season. In the auction, they bought most experienced captain and the one who lead Kolkata Knight Riders to win IPL trophy for two times. 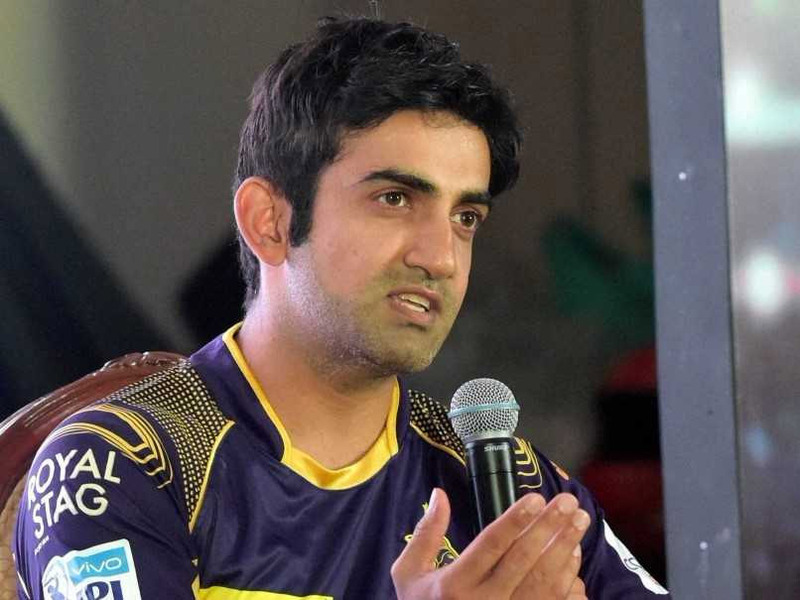 Considering the fact that Gambhir belongs to Delhi and he was in form, they have had a huge expectations. But things failed miserably for Delhi franchise as usual. Delhi Daredevils has already played 6 matches in this season till now and they’ve won only one out of them. Currently they are in the bottom of points table. Even thought few players are playing some good knocks, there are no collective performances from the team. So Gautam Gambhir decided to step down as a captain of DD taking the responsibility of losing the games. “As leader of this ship, I take up complete responsibility for where we are in the points table,And I have decided, seeing the points table and the performance of the team, to step down as captain. Shreyas Iyer will be the next captain. I think that is the way forward for the franchise. We all feel that he’ll do a very good job.” Gambhir explained the things to media today – April 25th.Even Gambhir is not in form. He is taking time to settle down on the crease. So that is why he has decided to step down as the captain and handover it to shreyas iyer. Kings XI Punjab won the toss at Mohali and invited DD to bat first. Delhi Daredevils posted some good total on the scorecard. Gautham Gambhir played really good knock and completed his half century but he didn’t get enough support from the other batsman. Colin Munro, Vijay Shankar and Shreyas Iyer got out for low scores. Finally DD ended up with 167 runs for 7 wickets after 20 overs. KXIP has started their debut match in this season very well with some good batting performances. Lokesh Rahul recorded fastest half century of IPL off 14 balls. Karun Nair and David Miller completed the rest and recorded their first win. Delhi won the toss and opted to bowl first in the second match. Ajinkya Rahane and Sanju Samson helped RR to put 153 -5 after 17.3 overs. Rain interrupted the match at this stage and forced to reduce the overs. Finally as per DL method, DD was required to score 70 runs off 6 overs. But they failed to chase the target and restricted to only 60 runs. This is the only match they won in the first 6 matches. DD won the toss again and elected to field. Mumbai Indians scored scintillating 194-7 at the end of 20 overs. Surya Kumar Yavav, Ewin Lewis and Ishan Kishan scored runs with the bat. While chasing, after the early dismissal of the captain, Jason Roy and Rishabh panth scored quick runs and Jason Roy recorded 91 off just 53 balls. Match turned up into a thriller where DD required to score 11 runs off last over and DD chased the target in the last ball and noted their first victory of the season. In this match as well, DD won the toss and invited KKR to bat first. DD bowlers failed to restrict KKR batting line up. After great knocks from Nitish Rana, Andre Russel, they’ve scored 200 off 20 overs. Every one expected Gambhir to bat well against their previous team but he failed to touch double digit figure. They got all out for 129 in 14th over itself. RCB won the toss and invited DD to bat first. Top order batsman failed again for DD but they got good partnership in the middle. Shreyas Iyer and Rishab Panth scored half centuries and helped team to get 174 runs for 5 wickets. But their bowler failed to stop AB’s storm innings 90 runs of 39 balls. DD invited KXIP to bat first. DD bowler did really a good work here. They restricted KXIP to a low total. Punjab scored only 143-8. but again DD batsman failed miserably to chase the low score. They have scored only 138-8 for 20 overs. Overall, we have seen good knocks from the youngsters and in some matches bowlers performed well. Lack of team performances caused DD to lose matches. Let us see if Shreyas Iyer’s captaincy make any difference to the team. Comment your thoughts through the comment box below. Cheers!